Shop in the comfort of New England’s largest heated showrooms with new models up to 50 feet on display in Portland. 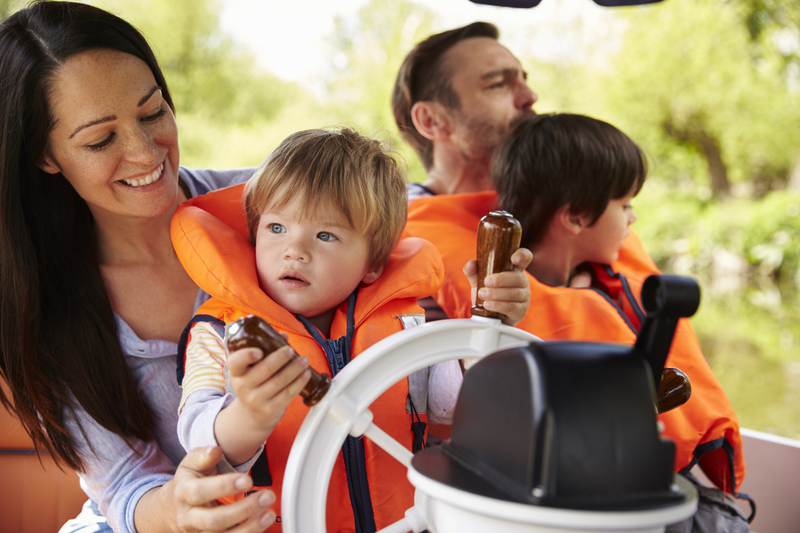 Whether you’re a new boat owner or a seasoned sailor, you have a big responsibility when it comes to safety. To comply with the law, the U.S. Coast Guard (USCG) requires that you carry a number of safety items onboard whenever you take out your boat. The following is a brief rundown of some of those items, as well as an extra you should always have on-hand. Boat owners are required to have safety devices that signal distress via sound to be in USCG compliance. All new and pre-owned boats are required to carry a whistle, and boats under 40 feet must also have an air horn. If your boat is bigger than 40 feet, you must carry a bell that’s at least 7.87 inches in diameter. You’re also required to carry visual distress signals on your boat, including three approved for nighttime and three approved for daytime. These instruments include hand-held or aerial flares, electronic distress lights, orange smoke signals, and orange distress flags. All pre-owned and new boats must have USCG-approved, B-1 or B-2 type fire extinguishers onboard, the number of which varies by boat size. Boats less than 26 feet require at least one B-1 fire extinguisher, boats between 26 and 40 feet require two B-1 extinguishers (or one B-2 type), and boats between 40 and 65 feet need to have three B-1 extinguishers (or one B-1 type and one B-2 type). The USCG requires you to equip your boat with one life jacket or life vest per person. They need to be USCG-approved, in good working condition (solid straps, thick foam, no tears or mold), and accessible to everyone onboard. They need to properly fit the person they are intended for, including children under the age of 12. If your pre-owned or new boat is longer than 16 feet, you’re also required to carry one throwable flotation device, such as a life ring. Though not required, you are strongly advised to have a first-aid kit onboard your boat at all times. These can be purchased at drug stores or marine supply stores, or you can assemble your own. They should include basic supplies such as bandages, gauze pads, antiseptic, sunblock, and bottled water, as well as pain and fever reducers, stomach medicines, and eye drops. Whether you’re looking to purchase safety equipment or buy a pre-owned or new boat, contact Petzold's Marine Center in Portland, CT. This boat sales center has been in business since 1945, stocking popular brands such as Sabre, Back Cove, and Regal. They also offer a range of yacht and boat repair services, as well as boat storage, winterization services, marine supply parts, and more. Visit their website to check out their new boat inventory and call (860) 342-1196 to speak with a representative today.